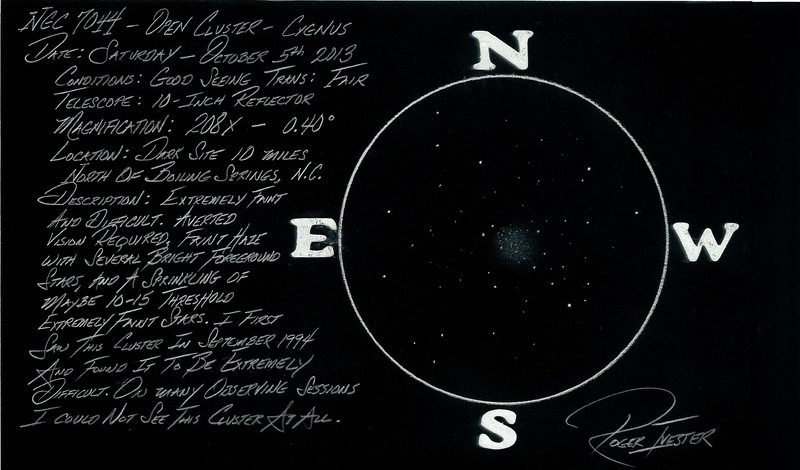 My first observation of NGC 7044 came in September 1994. I was very surprised how difficult this cluster was to locate and see. The 5.2 magnitude is very deceptive to say the least. I was using a 10-inch reflector and observing from my moderately light polluted backyard in the foothills of western North Carolina. This cluster proved to be very difficult indeed. I continued to check my star chart to insure that I was looking at the correct location. The cluster finally came into view at a magnification of 114x. When increasing the magnification to 250x, I was able to see a faint sparkling of very faint stars, with direct vision, but not constantly, and averted vision presented the best view. The cluster appeared as a sprinkling of tiny diamonds in the bottom of a velvet bag…surprisingly beautiful! I noted five or more brighter stars superimposed over the fainter members…possibly foreground stars? A pair of faint unequal stars are located on the NE edge of the cluster. During the months of September and October 2013, I made over five observations from different locations and under varying conditions. Using the same 10-inch reflector as 1994, this cluster seemed almost invisible, even from a dark site. During moments of steady sky, at a magnification of 208x, a sudden sprinkling of very faint stars appeared, but again, not constant. It should be noted that during two of my most recent observing sessions, with an average naked-eye limiting magnitude of about 5.2, the cluster could not be seen. The following sketch was made using a No. 2 pencil, and a blank 5 x 8 note card, with the colors being inverted using a scanner. Please note: The sketch presents the cluster quite a bit brighter than could be seen visually. This entry was posted on November 8, 2013 at 1:19 pm and is filed under Work File Only - Observer's Challenge Reports. You can subscribe via RSS 2.0 feed to this post's comments. Both comments and pings are currently closed.